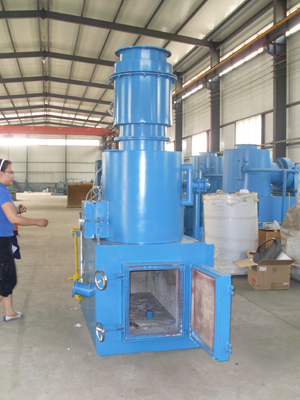 • Design, installation and commissioning of multi industrial waste incinerator.  Incinerate all types of liquid/solid hazardous/chemical/non hazardous wastes avaliable in the industries with proper scrubbing system with standard emission rates.  Producing ash and Gaseous fumes which are treated with cyclone type wet scrubber and caustic scrubber to produce air with pollutants in the permitted range and Non hazardous ash mainly inorganic salts.  Advanced gas treatment system to avoid emission of toxic gases (scrubbing system). 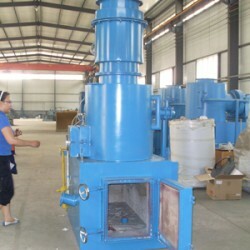  Low consumption high efficiency compact automatic burning system. It has special metal seal structure, refractory, bricking art, air distribution of multi-stream circling and advanced end-gas treatment without second pollution. Provide automatic control for users. The system should passed appraisal, fill up national blank and become substitute for import products. It should have notable economic and social benefit. 9). Low and high fire control governor. 10). Eye hole for visual indication. 11). Venturi Scrubber filtration system for smoke control emission. 12). Liquid spraying nozzles with the capacity of 25 % (20 nozzles). Emission standards are given below.